Wells West End post mill was a small mill that only ran a single pair of stones and a flour machine. A 26 foot diameter horse mill was operated adjacent to the mill, powering a flour mill and jumper. By 1829 a bake office was also being worked on the site. To be Sold by Auction By Thomas Platten At the Fleece Inn, Wells, Norfolk On Saturday 13 February instant at 11 in the forenoon. All those Three Windmills, Horsemill and Stable (the horsemill capable of containing a large quantity of corn) situated at Wells aforesaid and now in the occupation of Mr. William Green, of which possession may be had immediately. Enquire of Mr. Robert Cole, Fakenham. A Capital Substantial POST WINDMILL consisting of one pair of French stones of superior quality, flour machine nearly new and all the going geers complete; a large Horsemill lying contiguous thereto consisting of flour mill and jumper with the going geers all complete; Dwelling house adjoining consisting of ... stable, cart lodges and other outhouses all in good repair;excellent gardens well stocked with the choicest fruit trees etc. pleasantly situated within three quarters of a mile of the town and port of Wells, in a good corn country, in full trade and capable of doing an extensive business. Apply personally or by letter post paid to Corbett Cooke on the premises. To be Sold by Auction By THOS. PLATTEN On Friday January 13 1809 At the Crown & Anchor Inn, Wells, between the hours of 11 and 3. To be Sold by Private Contract and immediate possession given if required. A Freehold ESTATE comprising a good and commudius brick dwelling house and large garden with 4 acres of excellent land adjoining in high condition, together with Two Wind Mills, flour house and horse mill 26 feet diameter, stabling and other conveniences. The Situation remarkably pleasant and truly desirable for shipping and home consumption. Enquire of Mr. Robert Haycock. N.B. The above to be sold together or in lots for the convenience of purchasers. On Saturday 31 March Unless previously disposed of by private contract. All the Freehold ESTATE comprising a good and commodius brick dwelling house and large garden with 4 acres of excellent land adjoining in high condition, together with Two Wind Mills, flour house and horse mill 26 feet diameter, stabling and other conveniences. The Situation remarkably pleasant and truly desirable for shipping and home consumption. For particulars enquire of Mr. Robert Haylock. An excellent POST WINDMILL in thorough repair, a horse mill with corn chamber over the same, stable, chaise and cart houses, piggery, a garden well stocked with fruit trees etc. Also a pleasant Dwelling house ... outhouses, with about 3 roods of superior land adjoining. 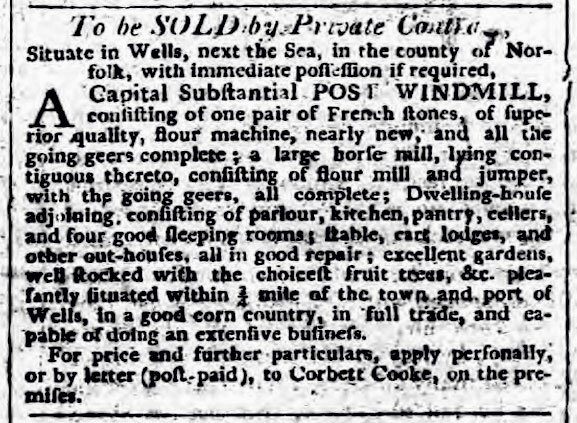 The above premises form an eligible Investment being desirably situated in the Town of Wells where flour may be shipped to any part of the Kingdom and where a considerable trade has been carried on for many years. The fixtures to be taken by the purchaser at a valuation an inventory of which will be produced at the time of sale. The Estate may be viewed on application to Mr. H. Tyrell, Wells. Possession may be had at Michaelmas next. A Capital Post Windmill with a good Dwelling house, a newly erected Baking office and premises complete. Also from three to four acres of Land adjoining. Apply personally or by letter free of postage to Mr. H. Tyrell of Wells, Norfolk. To be Sold by Auction by EDW. HOUGHTON At the Fleece Inn, Wells, on Wednesday 29 July 1829 at 3 o'c. A Capital POST CORN WIND-MILL with Flour Mill, Horse Mill, and excellent Granary; also a substantial and convenient Dwelling house, a newly erected Baking Office, Stable, Cart shed, a good Garden and every other convenience, with about three acres of Arable Land adjoining the same, eligibly situated at Wells next the Sea, now in the occupation of Mr. N. J. Plowright. A Capital POST WIND-MILL with a good Dwelling house, Baking office and Premises complete. Also from three to four acres of Land adjoining. Particulars of Mr. H. Tyrrell of Wells, Norfolk.